The 96 medals, including nine Victoria Crosses, two George Crosses and an Albert Medal, had been stolen from the Waiōuru museum early on the morning of 2 December 2007. The VCs included those awarded to Reginald Judson, Keith Elliott and Henry Laurent. Police recovered them in February 2008 after two businessmen offered a $300,000 reward for their return. Auckland lawyer Chris Comeskey brokered their return and the thieves reportedly received some money. Television presenter John Campbell was found by the Broadcasting Standards Authority to have misled viewers by failing to make clear that an ‘interview’ with one of the thieves actually depicted an actor. 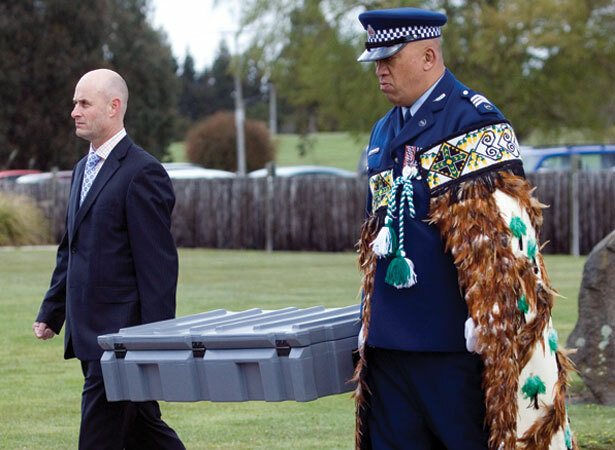 When the police formally returned the medals to the National Army Museum, 85 descendants of the 12 men awarded the medals were present at the handover on the Waiōuru parade ground. The army’s chaplain blessed the medals before they were put back on display. A week earlier, two Auckland men had appeared in court on burglary charges. One was eventually jailed for 11 years and the other for six. We have 3 biographies, 6 articles, related to Stolen medals returned to National Army Museum .